A strong winter storm has moved into the area upgrading the Winter Weather Advisory into a Winter Storm Warning. The precipitation is snow in the form of moderate to heavy snow. The snow is expected to taper off by early Saturday morning. Forecasters believe that anywhere from 6 to 10 inches of new snow will fall in the north Iowa area. This will make travel difficult with patchy blowing snow hampering visibility and glazing over the roads. 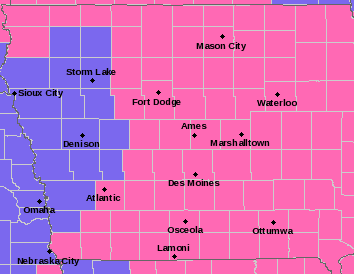 The counties effected by the Winter Storm Warning include all area counties in Iowa. In Minnesota, Blue Earth, Waseca, Faribault, and Freeborn are under the warning too. The National Weather Service believes the heaviest of the snowfall will begin around 1pm and remain that way until 2am Saturday when it will begin to taper off. With winds forecast to exceed 20 mph at times, blowing and drifting snow may cause problems for those who may be traveling on area roads. Statewide the situation does not get much better. Only four counties in Iowa are not under a Winter Storm Warning. Highways and interstates will be subject to heavy snowfall at times. Area cities are invoking snow events. Forest City declared one for Friday through Saturday. All overnight permitted vehicles must park in the designated parking lot at the corner of 6th and K Street from 2am to 7am Saturday morning.